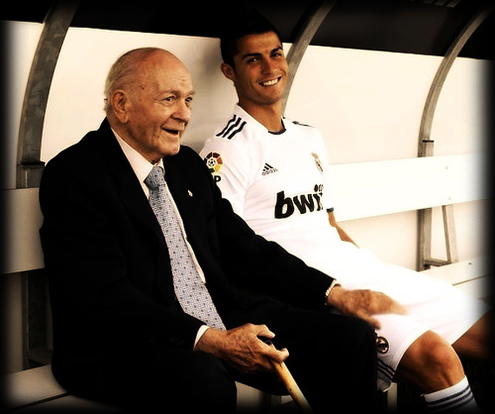 07.03.2011 » Di Stefano: "Ronaldo is an extraordinary player and a great person"
Real Madrid legend and honorary president, Alfredo Di Stefano, talked about some topics regarding Cristiano Ronaldo and Real Madrid. "Don Alfredo" says Cristiano Ronaldo is a tremendous player and a great person off the field. Alfredo Di Stefano, Real Madrid legend and honorary president, recently defended José Mourinho on his quest against the Spanish League fixtures and calendar, as well as he praised Cristiano Ronaldo. In an interview granted to newspaper "Marca", Di Stefano talks about several issues, covering a few of the most controversial topics of Real Madrid. "Don Alfredo" believes that Cristiano Ronaldo should play in a role where has more space to run ahead, instead of playing as a pure forward needing to hold defenders on his back. "A good player can play at any position on the field, but for Ronaldo to perform at his best, he needs to be play in the middle field, so that he's granted with more space to run upfront." Di Stefano kept on praising and hailing CR7: "Cristiano Ronaldo is an extraordinary player and a great person. He does things no one else does and that creates envy in people." Then came an interesting question, when Di Stefano was asked if he sees himself on Cristiano Ronaldo and Messi. "It's hard to say, I don't want to compare myself with them, but I had a bit of both, since I was fast, I had team spirit, scored goals, but I wasn't a natural dribbler and I had different kind of teammates playing with me back then." Di Stefano also said he still believes in the "Remontada" and used a funny comparison to refer to it. "We never know what will happen in football. It's just like in boxing.. you can be in control of the fight and all of the sudden you get punched and K.O. (Knocked Out). In football you can have a bad match and then you may not recover from it and start falling. To sing victory ahead of time is dangerous...". Di Stefano concluded the interview by saying that he also defends the idea that Cristiano Ronaldo should play every match whenever he's fit. "People say that Cristiano Ronaldo needs to rest more, but they don't really know what Cristiano needs. He has to play every match possible. The attitude of playing on every match is what gives him the enthusiasm that he has. Playing 3 matches per week doesn't kill anyone." Cristiano Ronaldo will probably miss next Spanish League game due to his current injury, but he should be fit to play against Lyon in the Champions League second leg, in around a week. You can watch Real Madrid vs Hercules livestreams this Saturday, and follow the game online here on ronaldo7.net.